I was prepared for battle this morning. Sunglasses. Handkerchief. Cell phone fully charged. I expected pain. I expected warfare. I expected to revisit a place of suffering and toil. Instead, I took a walk. I knew I was going for a walk, of course. But, this was a meaningful walk, and the decision to go had been weighty. This morning was my first time walking to the park a half mile from our house—the park that Craig and I walked to together at least a dozen times in the weeks before he died last summer. The park where he sat on a bench in the shade and recorded a four-minute video in which he poured out his heart, begging viewers to stand strong against the lies of the enemy. A spirit of suicide was sweeping the nation, taking out notable figures like Kate Spade and Anthony Bourdain, along with thousands of teenagers and adults who had succumbed to depression. Craig was wrestling with it, as well, and our daily power walk was a weapon in his arsenal. Exercise releases endorphins, reducing the perception of pain. We had a plan. We could beat this. Four weeks later, Craig lost the fight. And, I stopped going to the park. I always loved to walk. I spent part of my youth in Germany and a decade in Manhattan; walking for me was a way of life. It felt as natural as breathing, and almost as necessary. The first year of our marriage, Craig and I took early morning walks around the golf course near our apartment complex, sharing thoughts and dreams as we became more closely knit as a couple. Walking was good exercise, but for me, it was about connection. Those walks fueled my love for my husband and refreshed my soul. After we moved to our house, we rarely walked together. Occasionally, Craig would join me to take the dog around the block, or humor me by strolling through a street fair. I could trick him into walking when we went to Six Flags or traveled on vacation. But for the most part, walking was my thing, not his. So, I was pleasantly surprised last spring when he asked me for a suggested route to walk for 45 minutes. Two laps through the back alleys around our neighborhood and one time around the inner loop would do the trick, I replied, then realized just how mundane that path would be. Craig looked dismayed. 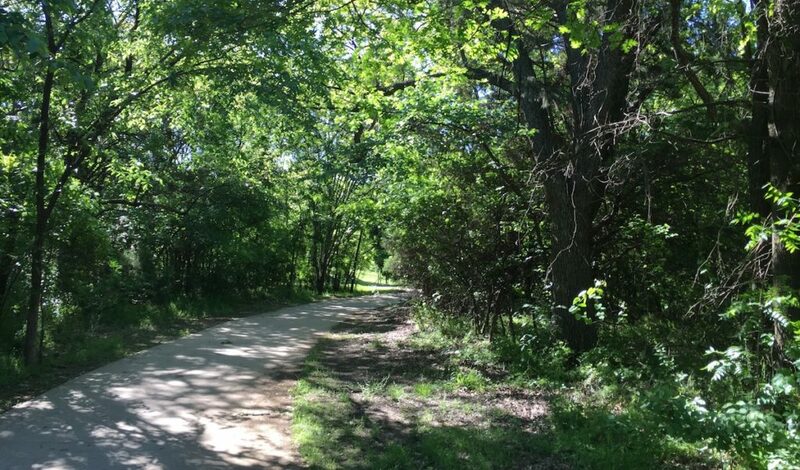 “Or, you could walk to the park and do a loop around the trails. That’s probably 45 minutes there and back,” I said. He set out the next morning on his own, returning home drenched in sweat. The following day, he was off again, strengthening muscles, building a routine. I was envious. After the first week, I asked whether I could join him. Sure, he said. What for him felt strenuous was for me pure bliss. Walking with my husband—my favorite person of all time. He stayed laser focused on keeping a brisk pace. I focused on speaking life over him, reminding him of his calling and God’s promises. We were in the fight together, us against the world. Do not be anxious about anything, but in every situation, by prayer and petition, with thanksgiving, make your requests known to God. And the peace of God, which transcends all understanding, will guard your hearts and minds in Christ Jesus. I thought about the park several times after Craig passed. How much I loved being out in nature, breathing the fresh air. I thought about keeping up the routine but always found an excuse. The late summer was too hot, I was traveling in the fall, and winter was cold and dreary. But now, it’s spring. Birds are chirping. Everything is green. I had nothing on my calendar. Today was the perfect day for a walk in the park. I wore my sunglasses as I left the house, and the tears came quickly. They trickled down my cheeks as I turned left onto the main road. The first two blocks slope downhill, and gravity propelled me along. Dogs barked behind fences. A crow swooped low overhead. I sang softly to myself as I walked, settling my mind, picking up details. The world was in Technicolor. 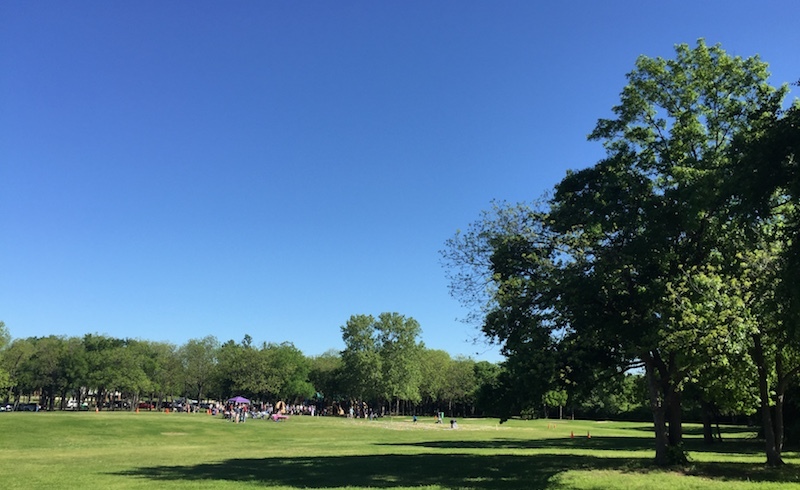 As I neared the park, I could see people gathered around a canopy tent by the tree line. Hundreds of plastic eggs were strewn across the grass nearby. Tomorrow is Easter Sunday, and families were there to celebrate. The children paced in anticipation, baskets at the ready, eyeing their bounty. They were waiting for permission to run. So was I.
I kept bracing for the pain, anticipating grief. But, it never came. Instead, I was captivated by the beautiful scenery and the bright sunshine and the cool breeze. The trails were empty, the atmosphere serene. I couldn’t help myself—I was happy. Halfway around the loop, I decided to embrace the joy. What a spectacular morning. Perfect weather, and the perfect day for a walk. I wished Craig was with me, but I knew my Husband was there. Jesus was right by my side. How else could I explain the peace in my soul? Whether I will make a walk to the park part of my daily routine remains to be seen. What I know for certain, however, is that I never walk alone. I am grateful for God’s unfailing love, and for the comforting arms of my Savior. Jesus spent three days in the tomb—Scripture tells us that He was a man of sorrows and acquainted with grief. He is not afraid to walk with us through seasons of darkness. And, He walks us back out. The same Spirit that raised Jesus from the dead lives in me. Today, I took a walk. Tomorrow is resurrection day. For someone in the throes of grief, those words are a kick in the gut. The very idea of life without the person you have lost is an insult to the senses. Suggesting that their absence could in any way eventually feel “normal” struck me as both disrespectful and dishonest. The word “normal” also carries with it some measure of certainty. Normal is predictable; it is commonplace. But grief, by its very nature, is disruptive. Grief creates chaos and turns life upside down, and though it may lessen over time, it never really leaves. It lurks in landscapes and photos and familiar smells. Months or years after the initial loss, grief shows up and throws a sucker punch. I had plenty on my mind yesterday, while I was driving to a local production studio for a video shoot. I had made sure to copy the client’s script onto a USB drive and brought a portable hard drive with me to transfer the footage. Speeding along the President George Bush Turnpike, I calculated how much time I would need to edit the video later that afternoon, and contemplated grabbing takeout on my way home. All was right with the world, as I exited onto Trinity Mills. And then it wasn’t. I suddenly realized that I was driving toward Addison Airport—the same route Craig and I used to take at least once a week when he got his pilot’s license back in 2015. Every building and tree was seared into my memory. I could picture the chairs and the coffee machine and the small fridge with bottled water in the hanger, where I would wait for Craig—feeling equal parts anxious and proud—while he would go up with his flight instructor. On the drive home, I would ask him to tell me everything that he had learned and listen attentively as he rolled through the details. 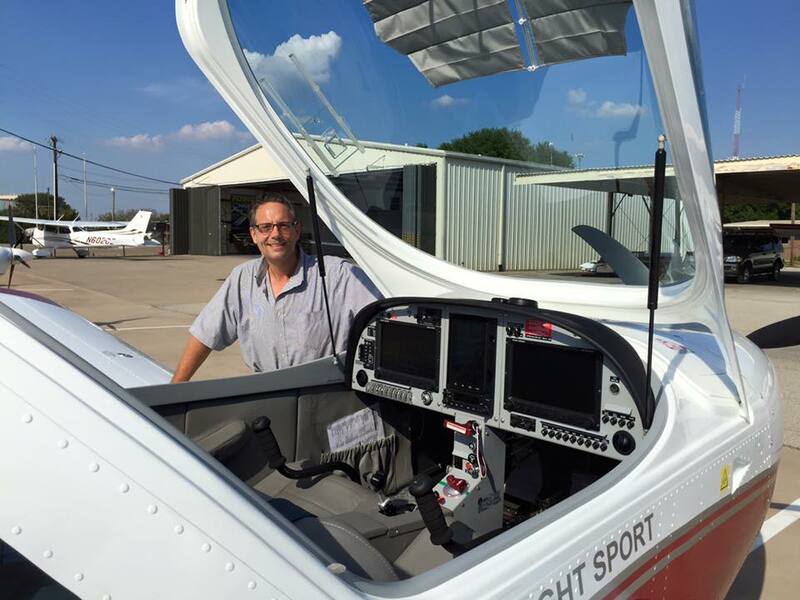 Getting his pilot’s license had been a lifelong dream, but Craig only pursued it after we started our aerial video business to meet FAA requirements at the time for commercial drone operators. He was harder on himself than necessary as he completed his flight training and, ultimately, passed the exam with ease. I flew with him only twice. What I wouldn’t give for just one more hour I the air together. As I turned onto Midway Road, I could see a small plane overhead coming in for a landing on the airstrip a few hundred yards away. Memories came flooding back, and tears trickled down my cheeks. “Ow, Daddy. Ow, ow, ow,” I said out loud, telling God plainly how much the grief hurt my heart. I took several deep breaths, knowing that I needed to pull myself together by the time I made it to the studio. “It still hurts so bad,” I muttered. Where was this font of pain coming from? I felt ambushed. But, by the time I walked into the studio, I was all smiles. The camera operator had never met Craig, and I saw no reason to burden him with my grief. We had work to do. Part of my job also is to put the client and crew at ease to ensure everything goes smoothly. Feelings would have to wait. At times, I lean into the heartache, wringing tears from my eyes in honor of my husband. For the most part, however, I choose not to wallow in sadness. I have people to see and places to go. Grief took a cheap shot yesterday. It cold-cocked me in the car. But I’m still standing. Those many memories, albeit painful, keep Craig front-of-mind. For that, I am grateful. Our adventures made me who I am today. Although I will never accept his absence as “normal,” I have learned to navigate the sadness—to tuck away my tears, when needed, and to freely let them flow at home or with friends. I have learned that grief strips away all pretense to bring us closer to others. And I have learned that, despite my reticence, there indeed is a future beyond the searing pain.